If you want to quickly price out what it would cost to build our sheds, our Excel project costing sheet will do most of the work for you. Just enter the price of materials in your area and everything will be totaled for you automatically! These are the same costing sheets that come with our shed plans and eBook. 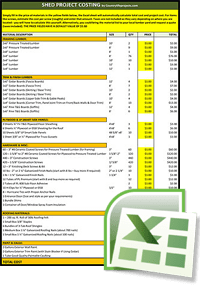 Our costing sheet is provided in Microsoft Excel format and we have included two formats – .xls (older versions of Excel) and .xlsx (Latest format). All price fields in the sheet are defaulted at $1.00 in the yellow column. Simply enter the cost of materials into these fields and the costing sheet will do the rest – Yup, it’s that easy! If you are experienced with Excel, you are more than welcome to modify this sheet for other projects. ENJOY!